While I was cruising around the exhibit hall floor, I ran into a familiar company. Will Hawkins started Recoil Rifle Slings back in 2011 and I met Will through a mutual friend back in 2013. 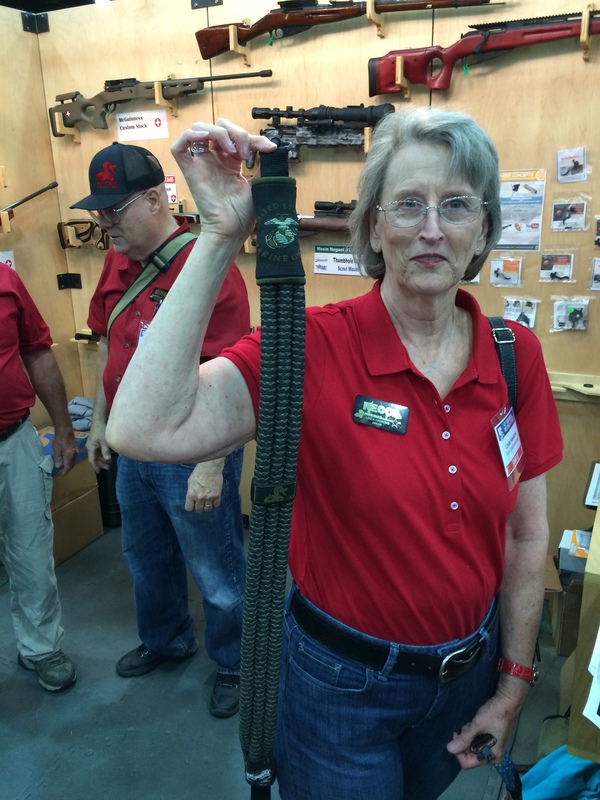 I met his parents, William B. Hawkins and Linda Hawkins at the NRA show and got some pictures of Mrs. Hawkins showcasing some of their latest creations. 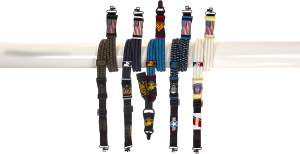 What is special about this company is that not only is it US military veteran owned, all of the slings are handmade by US veterans here in the USA. What’s even more incredible is that the slings are made from durable paracord (parachute cord) with which you can use in an emergency situation to do a number of things. 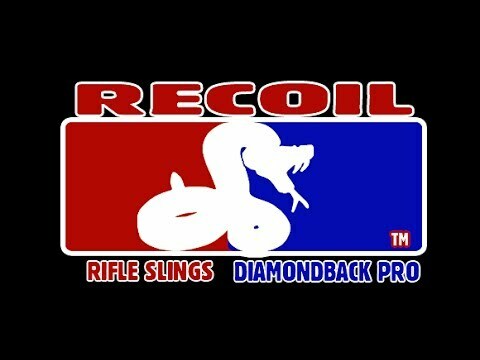 Recoil Slings come in three sizes: Diamond Back Pro, Viper 2-2-1, and Big Mamba. 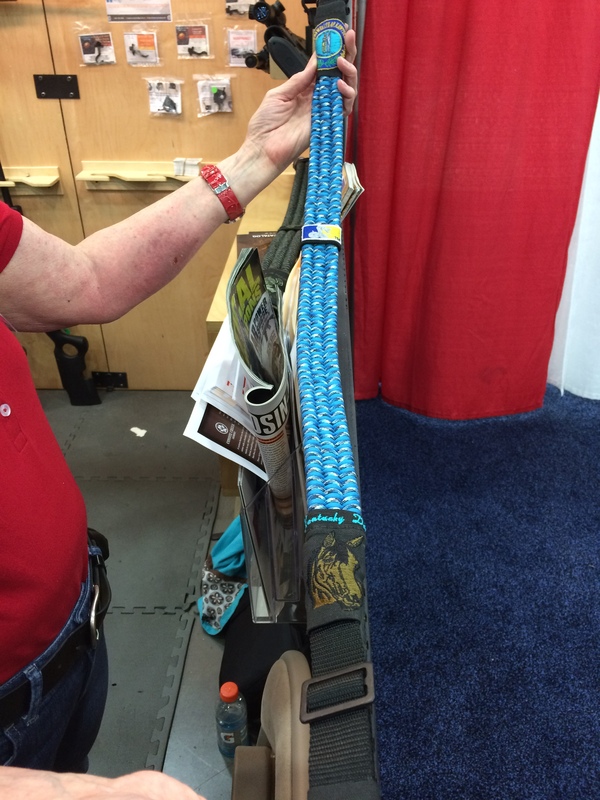 I own one of these handmade slings and it is among my most cherished firearm accessories. You can see the first blog post I did for this awesome company here and a follow up post with a video of my personal sling here. I am always looking for new innovations on existing platforms and I found just that at SHOT Show this year where I was introduced to the Cobalt Kinetics AR-15. 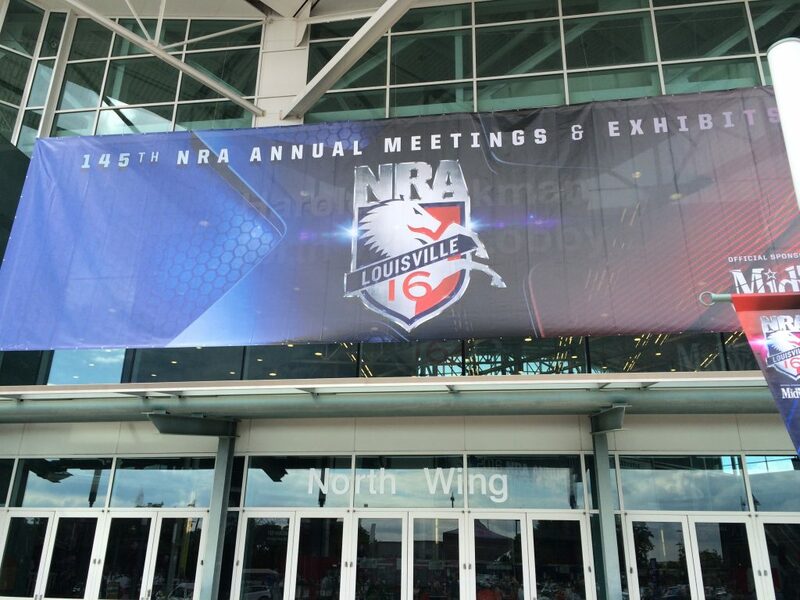 I visited this booth again at NRA just to get the detailed scoop on what they have to offer. 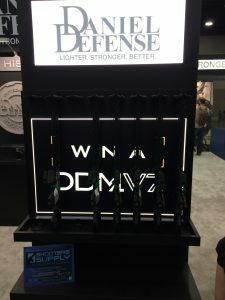 They have designed a system that drops the magazine out of the gun upon loading the last round out of the magazine, allowing you to feed another magazine into the gun and keep going without missing a beat. What’s more is that if your bolt stays open after the last shot, it will automatically close again and load the first round into the chamber upon simply loading the magazine into the gun. Talk about innovation! Nothing like this has ever been done before and the technology is impressive to say the least. This eliminates about three steps needed to change out a magazine on a traditional AR-15. While this may be perfect for a gun competition, I got to thinking how practical it would be on shooting wild hogs here in Texas if you didn’t have the time for traditional firearm reloading but had a target rich environment of pesky swine you needed to eradicate. I have actually been in some situations while hog hunting where we had hogs left to shoot but no available ammunition left in our guns. Just a thought. I ran into one of the reps from Desert Tech at the hotel I was staying at and decided to pay their booth a visit. 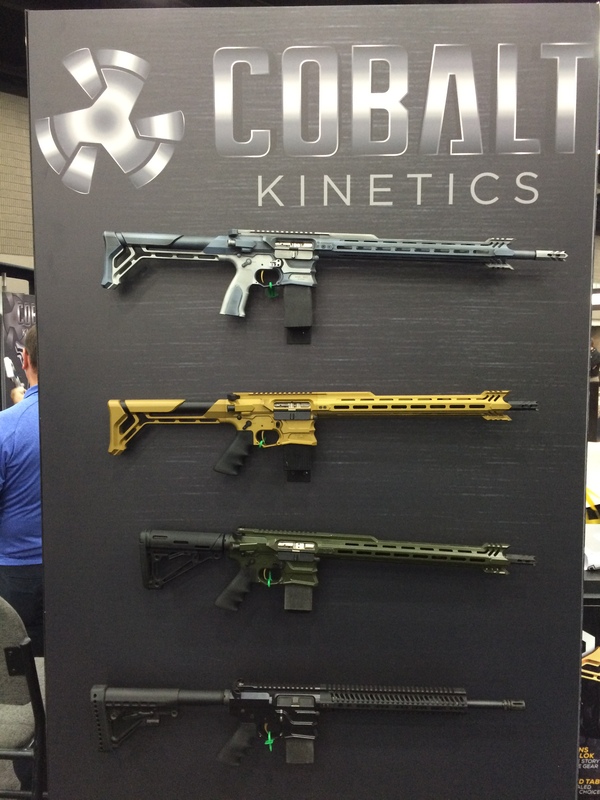 I have never seen rifles like this and I thought I would write a short piece about them. This modular bolt action platform is built with both the big game hunter and long range shooter in mind. 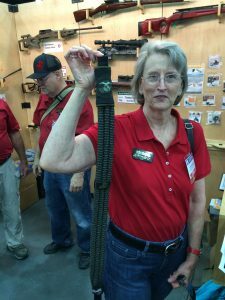 So what’s so interesting about a bullpup-style bolt action rifle you might say? Here’s the fun part. You can change out barrels and go from a .308 Win to a larger caliber in a minute or so! 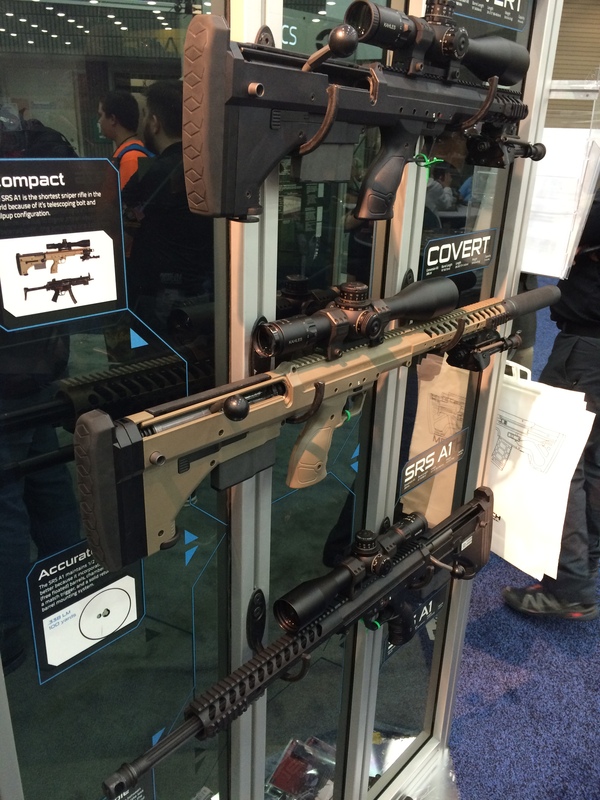 These guns are compact, convertible and accurate. It is hard to find rifles that will meet all three of those criteria as well in today world of firearms. 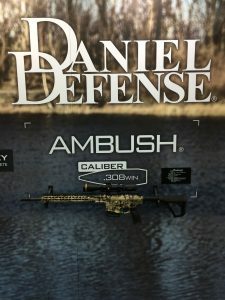 I have been impressed by the strides Daniel Defense has taken with the AR platform. Along with the great rifles chambered in .223/5.56×45 and 300 Blackout, new Ambush rifle in .308 Win was quite impressive. The ambidextrous controls on this rifle make it easy to be handled by left and right-handed alike. You can drop the magazine, release the bolt, or operate the safety from either side of the receiver. 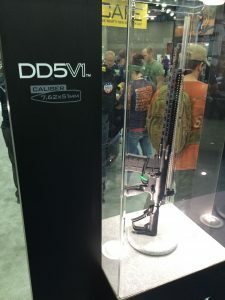 Also new this year is the DD32, an AR-15 magazine that broke the mold on what an AR magazine should be with its lightweight but strong build and increased ammunition capacity. This magazine was built with a carbon fiber reinforced polymer making it the lightest but toughest AR magazine I own and it hold two rounds more than any of my other AR magazines. I have written about that fact that we are in the “Golden Age” of the outdoor industry many times in the past. 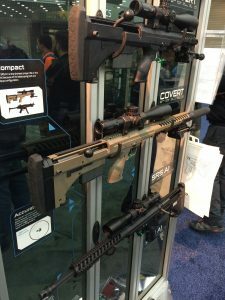 My goal in this trip to the NRA Show and with this blog series was to cover what was most interesting and unique this year. Competition between outdoor industry companies can be fierce but the winners and the end of the day are you and I, the consumers. New strides are taken every year to come out with what is bigger and better or even simply something that is unique and practical that we have never seen before. My point is that it all just keeps getting better for us in this hunting and shooting industry and I am blessed to have the opportunity to share some of it with you. Thank you, as always, for watching, reading, and listening.